Vancouver, British Columbia, Canada. December 13, 2007. Columbus Gold Corporation (CGT: TSX-V) ("Columbus Gold" or the "Company") is pleased to announce that the Company has entered into an agreement (the "Agreement") with Barrick Gold Exploration Inc. ("Barrick"), a subsidiary of Barrick Gold Corporation (ABX: TSE & NYSE), to explore and develop Columbus Gold's 100% controlled Utah Clipper and Crestview properties (the "Properties") which lie within the boundaries of the Cortez Joint Venture, a joint venture that is comprised of Barrick Gold U.S. Inc. 60% and Kennecott 40%. The Properties are located on Nevada's prolific Battle Mountain Gold Trend and are immediately adjacent to the world-class Pipeline-Gold Acres mine complex (click here to view a location map). Under the terms of the Agreement, Barrick can earn a 60% interest in the Properties by undertaking staged work expenditures totaling US$6 million over a six year period. Upon completing US$6 million in aggregate work expenditures, Barrick will have earned a 60% interest in the Properties at which time it may elect to earn an additional 10% interest in the Properties (for a total interest of 70%) by completing additional work expenditures of US$2.5 million by the 7th anniversary of the Agreement. Barrick can also elect to earn an additional 5% (total 75%) in the Properties by carrying Columbus Gold to a production decision and arranging financing for Columbus Gold's prorated share of mine construction costs. 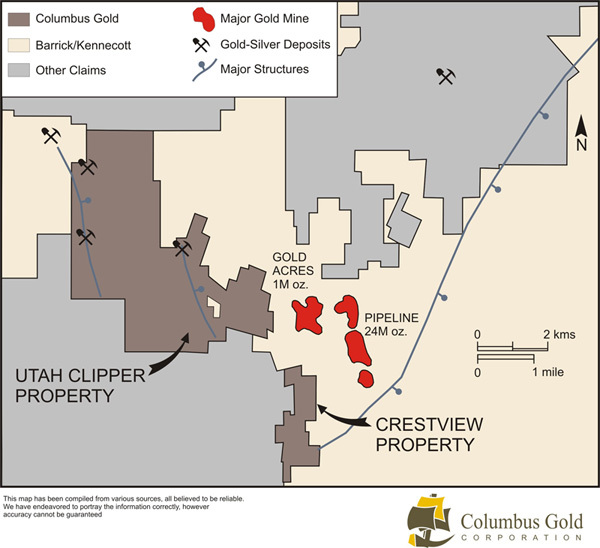 Columbus Gold's Utah Clipper and Crestview properties consist of 256 mineral claims, totaling approximately 5,103 acres, adjacent to Barrick's Pipeline-Gold Acres gold mine complex, in the Cortez-Pipeline sector of the prolific Battle Mountain Gold Trend. The Properties are underlain by 650 feet to +2,000 feet of siliceous sediments above the regional Roberts Mountain thrust fault. Prospective lower-plate carbonates, which occur below the fault, host the world-class Carlin/Pipeline-style gold deposits of the district. The principal geologic targets on the Properties include classic Carlin-style bulk-mineable, disseminated gold deposits and high grade, structurally-controlled vein deposits in lower plate carbonates. "We're very pleased with the terms of this Agreement" stated Robert Giustra, President & CEO. "Barrick operates a very large world-class gold mine immediately adjacent to our Utah Clipper and Crestview properties so ultimately they're the best partners for advancing the projects."